Advice: Try ownCloud with PHP 7 today, just download the pre configured VM and feel the speed. 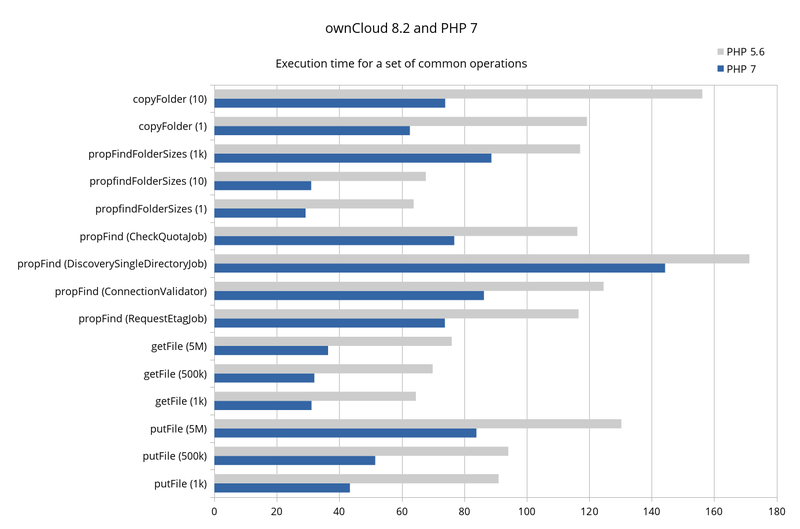 PHP 7 was released just a few days ago, and proves to be much faster than PHP 5. We tried it ourselves the other day on a CentOS machine with ownCloud freshly installed. It was lightning fast, even without any memcache! Please keep in mind that PHP 7 is still new, and even if it’s the stable release there could be PHP modules missing that you had in PHP 5. We haven’t tested it thoroughly and this guide is just for testing purposes. If you use ownCloud and have installed it via the ownCloud repositories then don’t use this guide as it will break you ownCloud installation. This is because ownCloud have dependencies in PHP 5, and you have to install ownCloud and PHP 7 separately to make it work. We guess that you are eager to try it and this guide is just a quick note on how to replace PHP 5 with PHP 7. The easiest way to install PHP 7 is via Ondrejs PPA. It will remove the old PHP 5 and replace it with the new PHP 7 via apt-get in Ubuntu. Please beware of which packages apt-get wants to remove before you continue. If you are doing this in a production system, MAKE A BACKUP of your system first, if something should go wrong. Press [ENTER] when it asks you to add the PPA. You can read a more detailed blog post on the ownClouds blog. Update your ownCloud instance with a script instead. Easy and configurable. Download it here.